It’s been quite some time, several months in fact, since I last saw a straight play here in London. It’s been even longer since I’ve seen a comedy play – when I do veer away from musicals I have a tendency to plump for the dramatics and tragedies, the Chekhovs and Shakespeares. This wasn’t always the case, by any means. In my youth I’d watch all the plays, from The Crucible to Abigail’s Party, and saw as many plays as I did musical theatre….with the West End as it is now the big musicals tend to claim my attention first! This year I’m aiming to stem the tide a little though, and get back into seeing a better range of theatre. 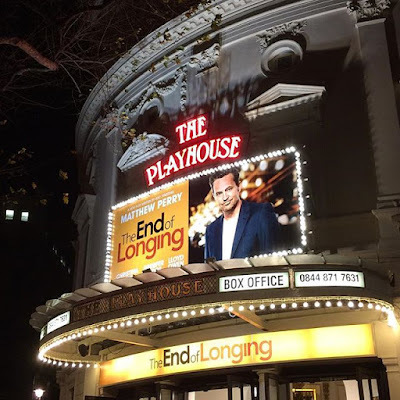 Tonight I kicked off this new ambition by seeing the opening night of the brand new play The End of Longing. Written by and starring Matthew Perry, it’s billed as a fast-paced comedy, and as I took my seat at the Playhouse I was intrigued by the prosepct of a brand new, unknown play. Confession: I’m a bit of a Matthew Perry fan. I loved Friends growing up, and Chandler Bing, with his witty barbs and sarcasm, was always my favourite character. Matthew Perry was great in the role, but it did mean that when he tried to break out in other projects, the Bing-ness often followed him. This is a shame, as he’s a truly gifted comic performer. I was excited to see him in a play, rather than onscreen, and in a role I wasn’t familiar with. Even more, I was excited to see a play that Matthew Perry had written. There’s something about writing, the nakedness of words on the page, that can reveal so much about a person, and I was excited to hear what he had to say. The End of Longing follows a quartet of characters trying to make sense of it all in the big bad city. So far, so cliché, but Perry introduces them with verve and humour, and the play takes plenty of twists and turns you might not predict. As the play progresses we get to know Stephanie, Jack, Stevie and Joseph and watch the paths their lives take, the times they fail and the ways they step up. The characters talk in a slightly stylised patter-song of drawled American, the script loaded with big long words (and f bombs aplenty). It took my ear a while to get used to the ways the characters talked, rather like the first time you watch something Sorkin has written, or to be a little less highbrow, like the first time you watch Dawson’s Creek or Gilmore Girls. As I grew more accustomed to the ebb and flow of this particular dialogue style, the more I liked it. Perry’s characters are flawed and sweary and verbose. As Jack, Perry does well. He plays the character broadly comic for most of the show, but at times there’s a real sadness and fear to this cad-about-town. You’ll root for him. The Bing-ness mainly stays far away, except, unexpectedly, when Jack is flirting. Stephanie is played beautifully by Jennifer Mudge – confident, charming, assured; until she’s not. Stevie is a high-strung pharma rep played by Christina Cole capably. At first I found this character pretty grating and was glad that as the action of the play progressed her traits became more mellow and understandable. Lloyd Owen was fantastic as Joseph, my favourite of the four, sometimes a simpleton, at others encompassing childlike wonder, anger, and wisdom, sometimes inside the same scene. The production was slick and considered, and I liked the backdrop of the city lights, never far away. I loved the score, perfectly capturing that loungey-bleepy-bloopy music so familiar to any of us who go to or who have been to bars, clubs, and other nightspots. I really enjoyed The End of Longing, laughing more than I was truly expecting, but also leaving filled with hope. The coda at the end brings a touch of gravitas to cut the humour and schmaltz, and gives hope that however flawed we may be, there’s always a chance for happiness. So interesting to read your review! I was thinking about going to see this but the tickets seem to be very expensive indeed so I'm waiting to see what the reviews are like. Glad to hear you enjoyed it.